Opening Day is a big deal. The grass is green. Anticipation is in the air. Poop bag dispensers are freshly refilled. So, with all the excitement of the season, we thought we would do a public service and share a few of our favorite local dog parks, in no particular order. And by all means, we invite you to chime in with yours. Then, text your dog friends and set up a play date. It was a long freaking Winter. Brommelsiek Park (pictured above) is a favorite of our St. Peters constituents. Located off Highway DD and voted “Best Dog Park,” this doggy wonderland has everything a dog and his best bud could want. First of all, it’s largemongous. There’s a pond where dogs can doggy paddle, fetch and run back to you for a big, wet hug. There’s a dock they can jump off. Even if you’re not local, it’s worth the drive. You can pretty much guarantee there’ll be a nap taken in the back seat on the way home. Forest Park Southeast is just a kong ball’s throw from our Dog Grove location (with several long-distance bounces, that is.) We’re proud of our affiliation with our neighborhood hangout as a founding sponsor, and we love that it came about as a result of some very committed dog owners who saw a need and made it happen on behalf of their besties. Tree Court Unleashed Dog Adventure Park is a favorite among The Watering Bowl staff. At 23+ acres, there’s lots to explore, including natural water features. There’s also a human who gets a lot of rave reviews, Wayne. Wayne is there to help dogs get acclimated and ready to run free, so you can have an amazing time. Located in Kirkwood, it’s pretty easy to get to for most of our cage-free canine community. 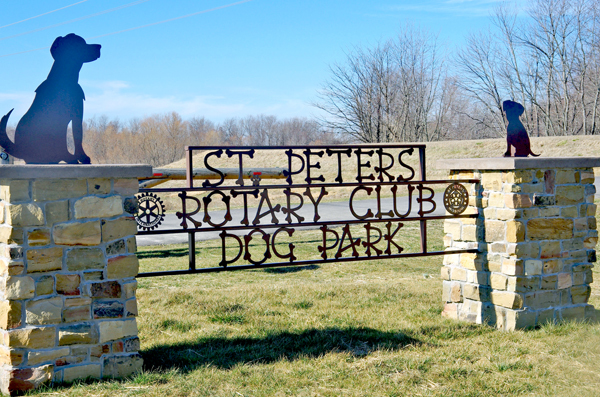 St Peters Rotary Club Dog Park is part of 370 Lakeside Park, just off 370 at I-70, and has agility equipment for dogs (sorry Parkourers). It also has separate areas for large and small dogs with a cutoff at 25lbs. There’s lake access, covered pavilions and year-round access. There’s even and adjacent RV park, if you want to make a weekend out of it. As always, we encourage you to explore and get the most out of your dog years. 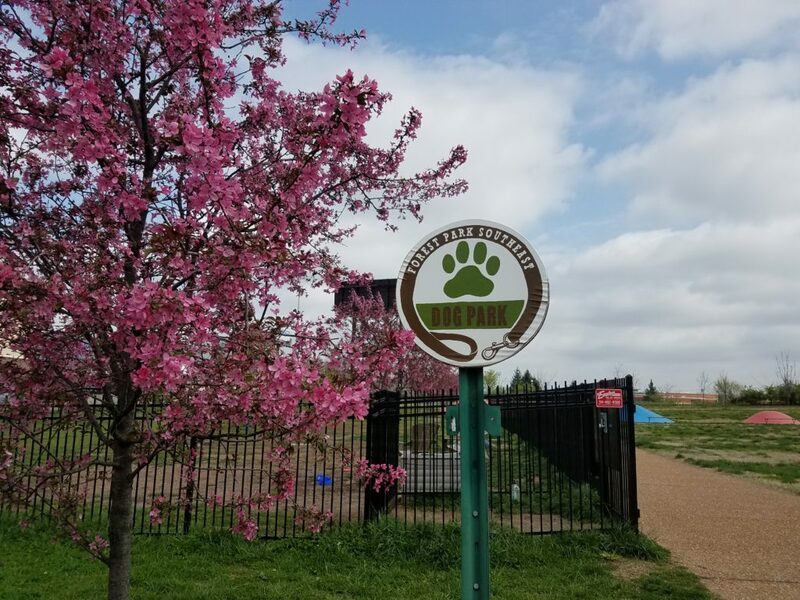 Note that, with the exception of Brommelsiek Park, these dog parks require nominal membership fees to help maintain the grounds and keep records of their visitors. And when you visit, please observe the rules and proper etiquette to make it the best possible experience for everyone. I absolutely LOVE Legacy Park’s Bark Park in Cottleville. It’s pretty close to home, and has a big park for the dogs. It also includes a smaller section for doggies that are small and may not like to be around the bigger dogs (although if there is a small dog, they are welcome with the big ones too). I noticed that almost every owner is attentive to their dog and picks up after them and also makes sure they don’t play too rough. Sometimes it can get muddy, but they sectioned off parts and rotate days each are open to help the grass grow better, so they have acknowledged this and are working on it! It’s one of mine and my pups favorite places to play! Hey Breanna, that sounds like a great park! We haven’t been there yet, but it is right by our new St Peters location, so we will definitely check it out. Thanks for sharing! Thanks Amy! We’ve heard great things, and it sounds like they have a lot of amenities. The bath station and agility yard sound fantastic! Sounds like they should be opening up again next month. We’ll definitely have to check that out! Veteran’s Tribute Memorial park on Kisker just opened a big dog park. Please the surrounding new park is beautiful. We went this weekend and there were lots of dogs and the people were all very nice. We’ve driven by it a few times, and you are right, it looks beautiful. Everything is so nice and new!